Heat oven to 400°F. Line 2 cookie sheets with cooking parchment paper or foil. 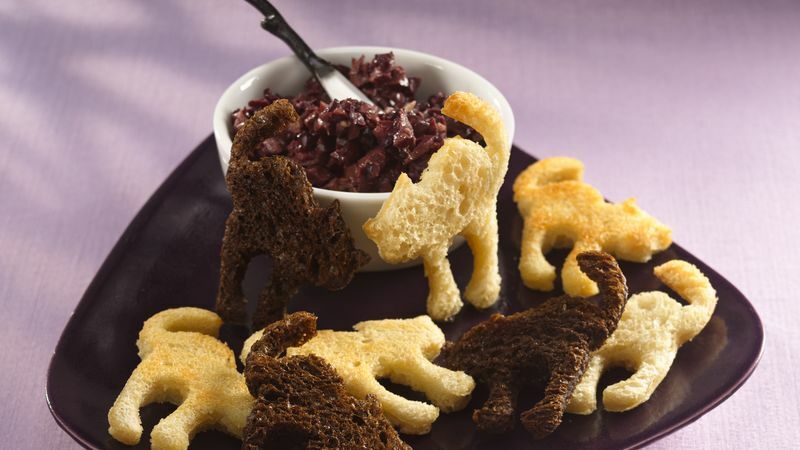 Cut 30 cat shapes out of bread using 2 1/2- to 3-inch cat-shaped cookie cutter. (Discard or save excess bread for another use.) Place bread cats on cookie sheets. Spray with cooking spray; turn over. Spray other side with cooking spray. Meanwhile, in medium bowl, mix garlic, olives, olive oil, lemon juice and pepper. Serve toasted bread with olive dip. For a shortcut, substitute 2/3 cup purchased ripe olive tapenade in place of the ingredients in step 3. Add to the Halloween theme by using spooky serving utensils.